To stay connected with your customers, give immediate feedback and help them succeed its important to take advantage of all the communication channels. One way to communicate important notifications and get customers feedback is the two-way SMS channel that can be configured inside Flexie CRM. We support two providers for this feature, Twilio and Nexmo. Before being able to activate this configuration, you will need to purchase a phone number from Twilio or Nexmo and then follow with this guide. To configure with Twilio you need to provide Twilio phone number, SID and Token. To get this information just login to your Twilio Account and go to Programable SMS / Messaging Services. If you haven’t created any Messaging Service in Twilio yet you can just go on by creating one. You will be prompted to give your service a name and choose the use-case that best fits you. In this case we selected Marketing 2-Way and this option has the capability to receive inbound messages from your customers. To receive inbound SMS you will also need to configure the Inbound Request URL. This URL in the REQUEST URL is used to receive and parse SMS message and replies from your customers. If you send some SMS and the customers reply back you will have this communication in the customer’s profile. 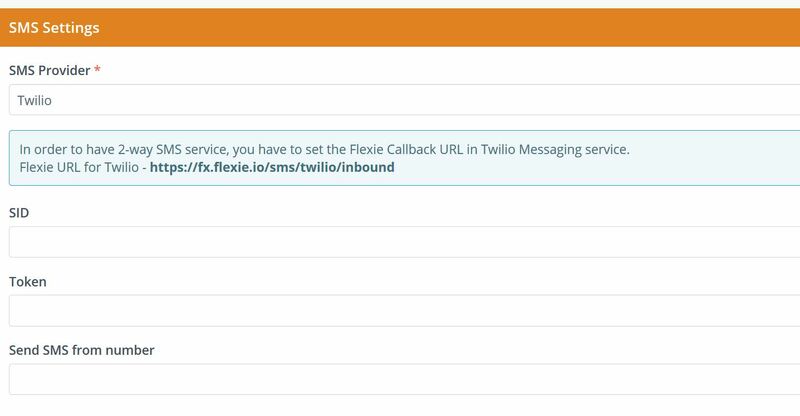 In your Twilio account you will have access to your API Credentials which you will use in Flexie CRM SMS Settings section. Copy ACCOUNT SID and AUTH TOKEN and paste them in Flexie CRM SMS Settings as shown below. To configure with Nexmo you need to provide Nexmo phone number, API Key and API Secret. To get this information just login to your Nexmo Account and go to Settings / API Settings. In there you can configure the Webhook URL for Inbound Message.You can also configure Webhook URL on number level on Nexmo. 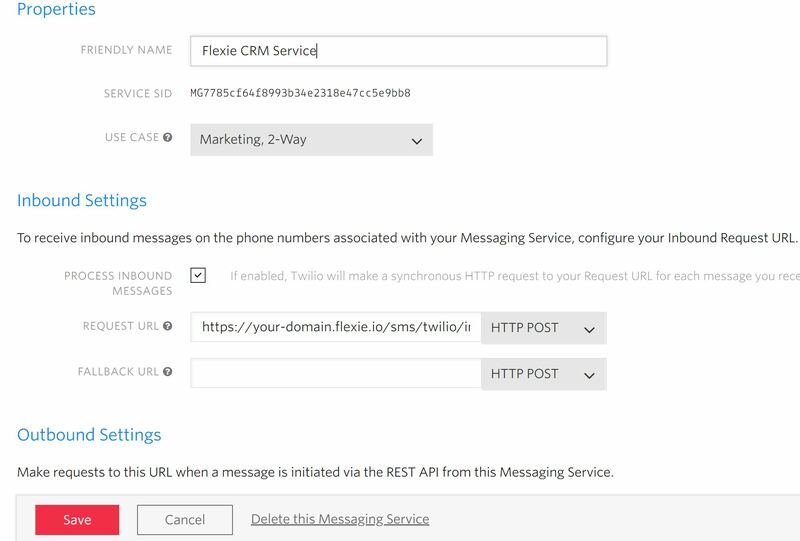 Copy the API Key and API Secret and then paste them in Flexie CRM SMS Settings section. After successfully setting up your Twilio or Nexmo number you can send and receive SMS messages from your customers.